Q: How do you follow a Friday evening assembling dinner entrees to fill your freezer? A: By visiting the Farmers' Market Saturday morning, for produce to fill the crisper! Since watching the documentary Food, Inc a month ago, I have been trying to grow more knowledgeable about the origins of the food I feed my family. I've got the Batch Party process under review, thinking about how I can buy the meats & ingredients with identifiable origins while also sharing the assembly process with my friends, but that's a whole other piece of the puzzle. For now, I am at least reducing the amount of processed food I purchase, and choosing locally sourced food whenever possible. 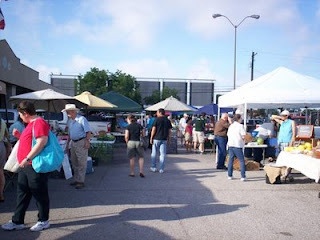 This week I made it to the Brazos Valley Farmers' Market and for $13 came away with a pound of carrots, a pound of onions, two pounds of potatoes, a 2 qt container filled with sweet red peppers, a quart ziplock bag of spinach, a pound of okra, and 3 pounds of blackeyed peas, still in jackets. On my way home from the Farmers' Market, I happened along a country property with a large hand-lettered sign reading, "PEARS FREE." I made time to stop and chat with the lovely lady of the house, and went home with two shopping bags full of sweet, crunchy, cooking pears I picked myself. Saturday night we already had dinner plans, but Sunday dinner was bound to be divine given the contents of my kitchen! Of my ten entree choices, I went with Dijon Pork Chops. Boo literally spent hours shelling the blackeyed peas for one side dish. I was so proud. Rooster joined her for awhile, and the two of them amused themselves opening each pod and exclaiming, "Look! These peas have black eyes, too!" They didn't tire of it nearly as fast as I expected, but I still ended up recruiting Boo's next door neighbor friend to help finish the job. Eventually all the peas were shelled. Then my Louisiana neighbor not only told me how to cook the peas, she sent over a bit of Crisco so I could make them authentic. I'm still not sure what was more hysterical about that whole exchange: my horror at the idea of using (a teaspoon of) Crisco, or hers at my suggested alternative of bacon fat. I mean, c'mon, at least I know where the bacon fat came from, and it was something I ate, and it's tasty! I don't really know what Crisco exactly is, but I think it's related to death. I just enjoyed laughing at both of us. It's fun. I love that we entertain each other. Meanwhile, once the girls finished shelling peas, I put them to work peeling/coring/slicing the pears so I could cook them into pearsauce. The pears were exactly as promised, sweet and crunchy. Sprinkled with a little cinnamon sugar, they paired nicely with the chops and peas. Dinner rounded out with a salad including the spinach from the market, and everyone pronounced it a spectacular meal. Well, everyone except Boo, who privately confided to Louisiana Sammy afterward that those peas weren't very tasty, considering how much work it took to shell them. This post is linked to Tuesdays Unwrapped. Today I unwrap the pleasure of preparing new food; something I got directly from the farmer or picked off the tree.